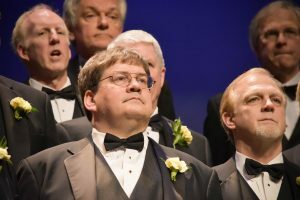 John Rakes is a highly versatile musician who joined the Naperville Men’s Glee Club as Artistic Director in July 2018. His experience as a conductor, choral musician, music educator, and collaborative pianist and his personal love and experience with male ensembles has positioned him perfectly to carry forward and expand the NMGC heritage and reputation established under Founder and Director Emeritus Bonnie Roberts. John also serves as the Artistic Director of the Downers Grove Choral Society, a community ensemble that continues to celebrate a long-standing tradition of choral excellence. Recent performances include Mozart’s Requiem, J.S. Bach’s Christ lag in Todesbanden, and Orff’s Carmina Burana. Dr. Rakes also teaches as an Adjunct Professor at both Wheaton College and Kishwaukee College. Dr. Rakes earned a Doctor of Musical Arts in Choral Conducting and Pedagogy (D.M.A.) from the University of Iowa, where he was privileged to study under Dr. Timothy Stalter and Dr. David Puderbaugh. At Iowa, he served as a graduate guest conductor and performed as an accompanist to the choral department while singing in the University’s elite choral ensemble, Kantorei. His doctoral thesis, “A critical edition of Missa Gratiarum in C by Antonio Caldara (ca. 1671-1736)”, was an international research and editorial project. Dr. Rakes earned a Master of Music (M.M.) with an emphasis in Music Education from Northern Illinois University. At Northern, he studied choral conducting, arranging, and choral literature under Dr. Eric Johnson. Dr. Rakes also earned a Bachelor of Music Education (B.M.E.) from Wheaton College. At Wheaton, he studied conducting under Dr. Paul Wiens and Dr. Daniel Sommerville, while completing studies in piano and organ under Mr. John Zimmerman and Dr. Edward Zimmerman, respectively. Dr. Rakes is a proud “Old Man” (alumnus) of the Wheaton College Men’s Glee Club. Bonnie Roberts received her early musical theater and performance training at New Trier High School, Winnetka, Illinois, under the direction of Dr. William J. Peterman. She earned a Bachelor of Science Degree in Music Education from the University of Illinois, studying voice with James Bailey and music education with Dr. Coleen Kirk and Dr. Bennett Reimer. During her U of I years, she worked with guest artists Robert Shaw and John Cage and also assisted with doctoral research into the needs of married women students. Ms. Roberts has completed additional graduate study at the U of I and taken courses at North Central College and Northwestern University. Ms. Roberts has served as a choral director for fifty years, primarily in the Boston, San Francisco and Chicago areas. She is also the arranger of many choral works and a vocal performer. She has been a public and private school music and special education classroom teacher and aide at all age levels and home-schooled one of her children with special health needs. Junior and Senior High choral groups prepared for competition in festivals and conferences under her direction have consistently received the highest ratings. Ms. Roberts has been awarded the Key to the City of Naperville by Mayor George Pradel for her work with the Glee Club and in the community. She has received the Naperville Jaycees Distinguished Service Award for her work in the arts. She is a member of the American Choral Directors Association and Chorus America. Melanie has over 25 years of performing and accompanying experience, including as a soloist and collaborator with vocalists from pop to opera and instrumental ensembles and soloists. She has received awards at jazz festivals and piano competitions, including winning the MYSO concerto competition when she was 16. In 2001, she received a Bachelor of Music in Piano Performance from Southwestern Oklahoma State University where she studied under the late Dr. James Breckenridge. Besides the Naperville Men’s Glee Club, Melanie is active in her local community of Joliet as an accompanist for choirs and churches as well as Vocal Music Accompanist and small group director at Joliet West High School. She also plays at retirement homes, weddings, banquets, parties, and corporate functions. Ms. Brsan maintains a piano studio in her home of about 30 students from the southwest suburbs. They perform in recitals, community performances, and competitions, and several of them have received awards and scholarships. Many have pursued music further into college and in their careers. She continues her post-graduate education by attending various pedagogy conferences and workshops throughout the country as well as extensive technique training. Melanie is on the piano and chamber faculty at the Kankakee Valley Piano and Chamber Camp at Olivet University as well as Green Mountain Suzuki Institute in Rochester, VT. In 2003, Melanie was chosen as a finalist for the MTNA Studio Fellowship Award for best new teacher in the United States. When she’s not rehearsing, performing, or teaching, Melanie enjoys traveling and exploring Chicago. She also married her childhood piano friend in May 2014, and was blessed in the wedding ceremony with the music of the NMGC and local musicians she has worked with through the years! Tim began playing the piano at age seven, and began singing in his church youth choir shortly thereafter. He continued singing through high school with the Lane Tech Chorus. After high school he joined a local rock band, Right Track. performing regularly in Chicago and the northern suburbs for more than ten years. He also did some solo work during this time, including original music and vocal arrangements for a vaudeville comedy revue, “Comedy On Rye,” many solo jazz dates, and quite a few nights that turned into mornings at blues clubs in Chicago, including a memorable night with James Cotton at the Kingston Mines. Tim earned an Associates Degree in Computer Science from the University of Illinois at Chicago. With marriage and a family, the rock and roll lifestyle came to an end, and Tim took a position as church organist. He has enjoyed this challenge for the last sixteen years, currently as organist / cantor at St. Patrick’s Church in Joliet and as pianist / choir accompanist at St Ann’s in Channahon. Tim also does private piano instruction and accompany for Joliet Central band and choral students, including the Joliet Central show choir, the Show Steelers. He sings in the first tenor section and serves as assistant accompanist. 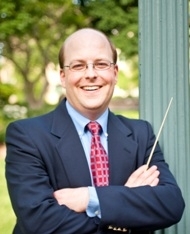 Steve has been involved in choral ensembles since high school, and has loved singing and directing music through college and beyond. In 2008 Steve completed a graduate program at Bob Jones University Seminary, and has since returned to Naperville to develop a career in ministry and music. Steve and his wife, Rachel, live in Aurora and have four children. They are both actively involved in serving their Savior, Jesus Christ, with other believers in our community. Steve is very passionate about music and the power that it has to influence lives, and will continue to find ways to weave singing and conducting into his life.